Remember how I said that I had a really cool bento and the camera ate the picture? Well, I kind of had to recreate it yesterday because I wanted to share it. ;o) It's not like the kids didn't have to eat anyhow, they get rather demanding if I don't feed them! 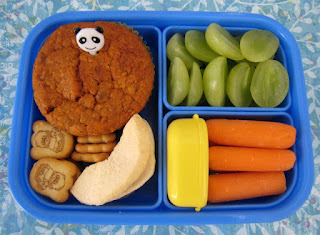 The recreated bento features a chili-cornbread muffin, topped with a cute little panda pick. The panda pick was chose to match the panda crackers right below the muffin, of course. Next to those are some freeze dried apple slices, then sliced grapes on the upper right and carrots with a bit of ranch dip on the lower right, all packed in my Paperchase Alien Bento (I really want another box like this one, it is the perfect size for F&B).